Courtesy of Keller Williams West Ventura. The lovely Bella Vista estate brings you all of the enchantment of Ojai. 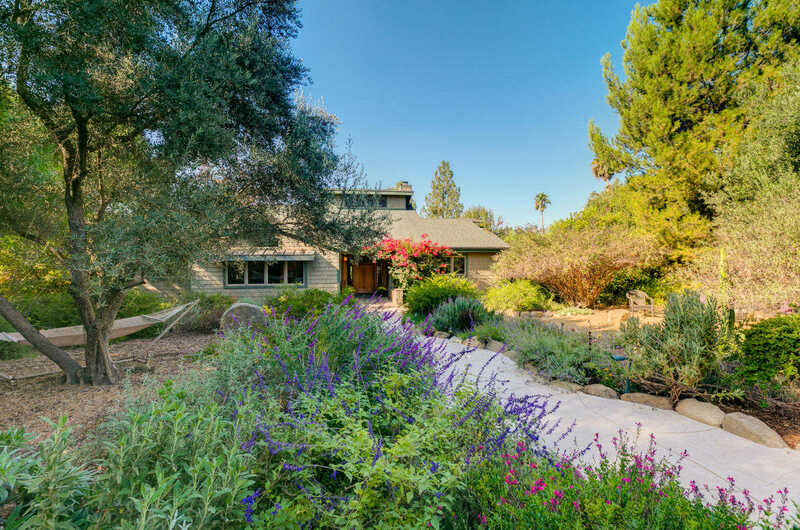 This gated, very private property consists of two homes-a 4BR/3BA main house and 2BR/1BA guest house, surrounded by a fragrant orange grove, rose, sage, lavender gardens, raised vegetable beds, a swimming pool, natural rock walls, and beautiful views. You will feel at peace in this light-filled home, including classic Craftsman-style architecture, quality features like reclaimed hardwood floors and window/door casings, wood-burning stone fireplaces, and a gourmet cook's kitchen with Viking range and Sub-Zero fridge. Four spacious bedrooms invite you to relax and renew. The three baths feature artistic tile work designed by the famous RTK Studios. The romantic upstairs master suite includes stained-glass windows, its own fireplace, a balcony overlooking the pool, and magical sunset views. Follow the meandering footpath to the historic 2-bedroom guest house with full kitchen and cozy vintage charm. Please, send me more information on this property: MLS# 18-3707 – $2,195,000 – 4440 Grand Ave, Ojai, CA 93023.